It was another good year for beer in Oshkosh. The big news, of course, was the opening of Fifth Ward Brewing Company. But this year was significant in a number of ways. In chronological order, here are a few of the local highlights from 2017. 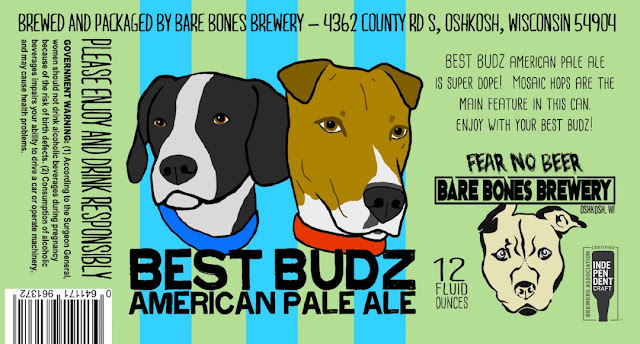 On February 7, Bare Bones became the first brewery to can its beer in Oshkosh since 1972 (the year Peoples Brewing closed). Bare Bones used a mobile canning unit to package Double Dog Dazed, an 11% IPA. It was also the first time an Oshkosh brewery packaged its beer in 16-ounce cans or sold beer in four packs. Bare Bones had additional canning runs in May and December. Fletch's Local Tap House opened on May 6 at 570 North Main Street. Owner Jeremy West also runs the neighboring Varsity Club. Fletch’s launched with 24 draft lines in a newly remodeled space. The building dates to 1902. With the addition of Fletch's, there are now approximately 200 craft-beer draft lines in the bars along North Main Street between Irving and the river. In September, Lion’s Tail Brewing in Neenah released Juice Cloud, a New England Style IPA. 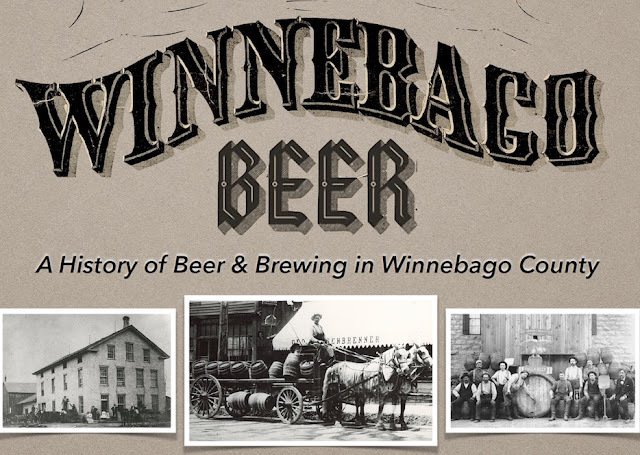 It was the first time the style had been produced by a commercial brewery in Winnebago County. 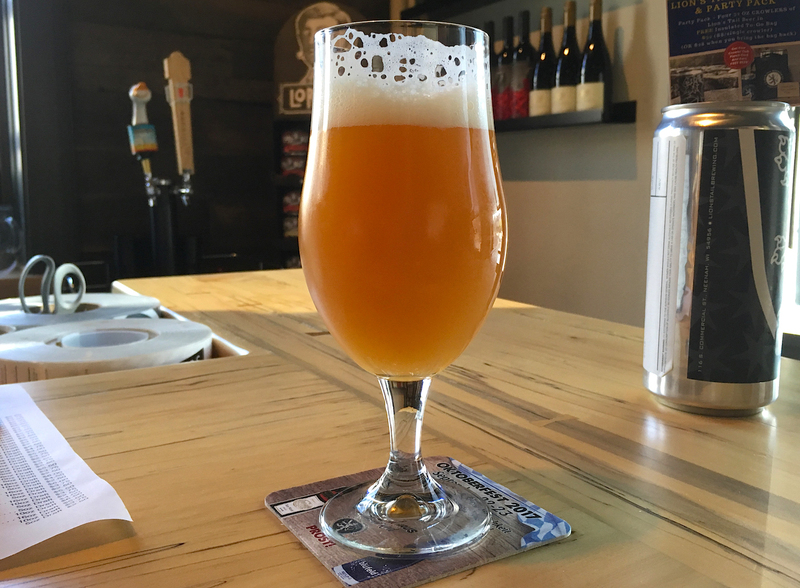 Juice Cloud has gone on to become the brewery’s best selling beer. For the second year in a row, both Bare Bones and Fox River produced fresh-hop beers. Bare Bones' Wharrgarbl was brewed on September 9. All of the hops that went into the beer were Wisconsin grown. This hasn't been done by a brewery in Oshkosh in more than 100 years. Bare Bones head brewer RJ Nordlund selecting hops at a Gorst Valley Hop Farm in in Nekoosa, Wisconsin. Fox River's Big Ed's Hopyard Ale was brewed on September 13. 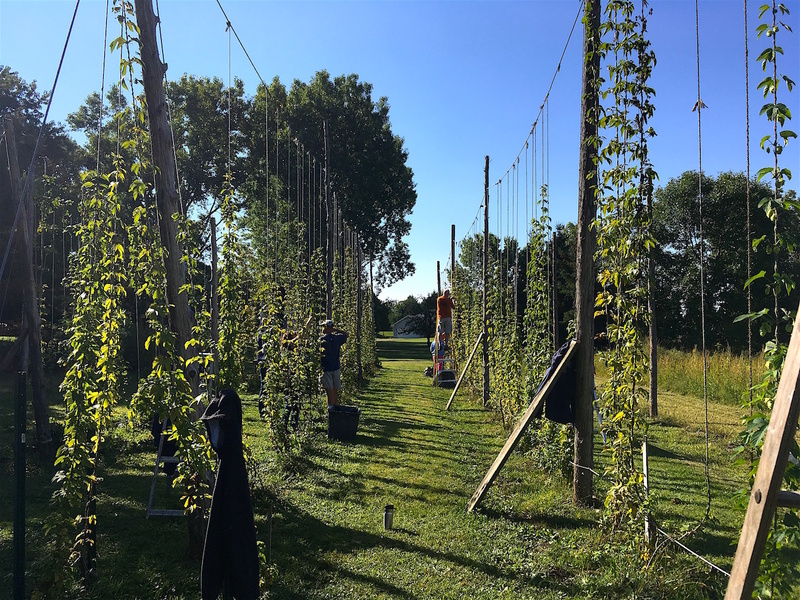 The bulk of the hops used were grown in a Winnebago County hopyard cultivated by Scott Clark and Steve Sobojinski. This year's harvest included hops raised from cuttings of wild hops growing on the site of a former hopyard established in the late 1840s in Allenville. This site appears to have been the location of Winnebago County's first hop farm. The Fox River beer is the first commercial beer since 1879 to use hops from this lineage. Production at local breweries has been strong all year. By the end of October, Bare Bones, Fox River, and Lion's Tail had each produced more beer than they had in all of 2016. At Knuth Brewing in Ripon, production has more than doubled. The final numbers aren't in yet, but it appears likely Fox River will unseat Stone Arch this year as the largest brewer in the Fox Valley. 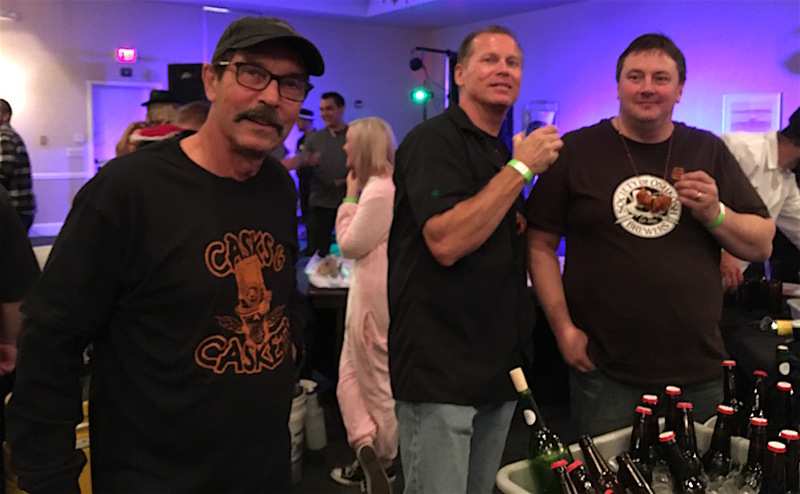 After a three-year hiatus, Wisconsin’s first and only all-homebrewed beer festival returned to Oshkosh on November 4. Sponsored by the Society of Oshkosh Brewers, Casks and Caskets was suspended after state revenue officials deemed the club’s 2014 festival unlawful. This year, the SOBs staged the festival as a free event to conform to the latest interpretation of Wisconsin’s homebrew law. The $6,000 in donations collected at the festival went to the Oshkosh Hunger Network. 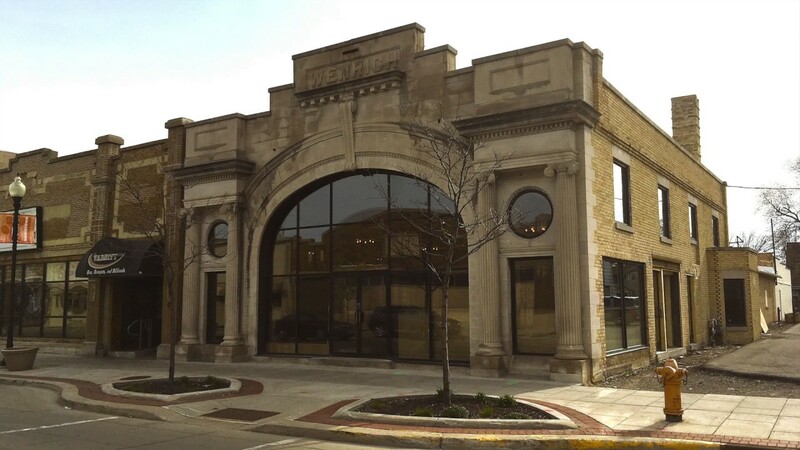 On November 8, Fifth Ward Brewing Company opened at 1009 South Main Street. It marked the first time since 1956 that three breweries have operated simultaneously in Oshkosh. Co-founded by Ian Wenger and Zach Clark, the brewery had been in planning since 2012. The first beers issued by Fifth Ward were Burl Brown, a brown ale made with cinnamon and molasses, and Hades’ Secret, a porter brewed with chocolate and mint. Zach Clark (left) and Ian Wenger, opening day at Fifth Ward Brewing. 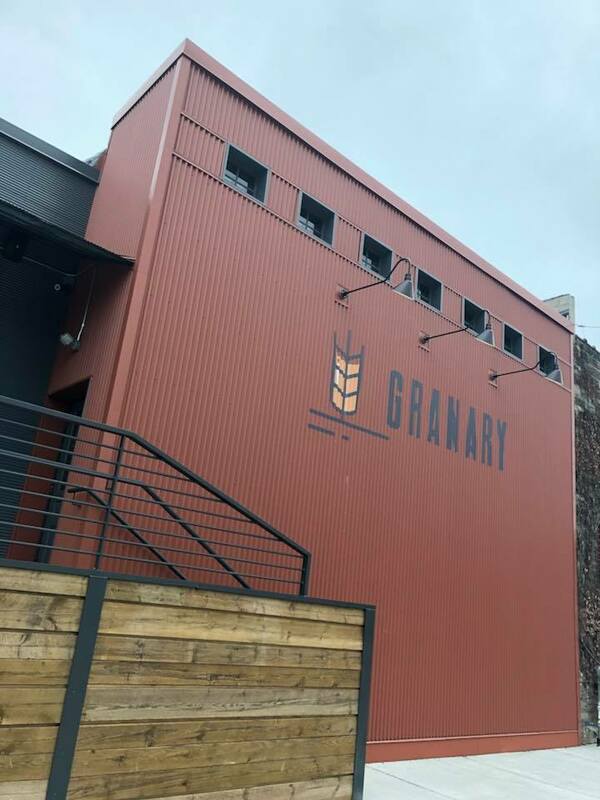 The Granary Brew Pub opened in early November. 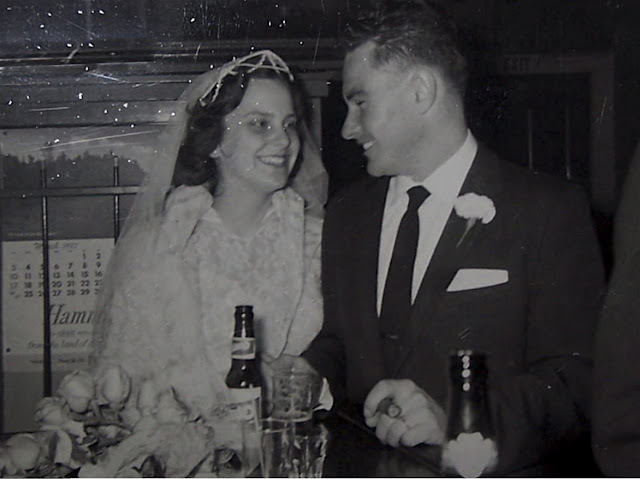 The craft-beer bar and restaurant began with 30 Wisconsin-brewed beers on tap. All four Winnebago County breweries were represented. In all likelihood, this was the first time beer from four separate Winnebago County breweries has been served on tap in the same bar. The coming year is bound to be interesting. On the tavern side, I doubt we’ll see the launch of another full-fledged craft beer bar. We may have reached a saturation point there. But on the brewery front, we’ll likely see more development. HighHolder Brewing, which has been threatening to open for months, may finally break through. Let’s hope so. New breweries are also slated for Omro and Menasha. If each comes to fruition in 2018, we’ll have seven breweries in Winnebago County. That hasn’t happened since 1894. The beer scene here is maturing. Room for growth remains. Onward! A few years ago, a beer festival like the one coming in January would have been impossible. We didn't have the breweries for it. All that has changed. It's time we celebrate the revival of our local beer culture. 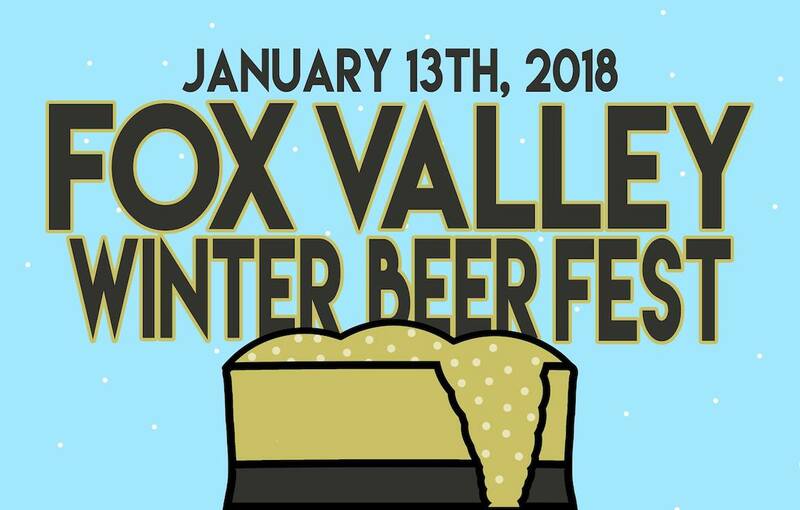 On Saturday, January 13, 2018, Bones Brewery in Oshkosh will host the Fox Valley Winter Beer Fest. There's been nothing like this in our area before. All of the beer poured at the festival will be from local breweries. Eight of them in all: Appleton Beer Factory, Bare Bones, Fifth Ward, Fox River, HighHolder, Knuth, Lion's Tail, and Stone Arch. Rushford Meadery and Winery will be there, too, pouring cider, mead, and wine. This marks the first time these breweries (and winery) have worked together on an event like this. So, of course, they're going to do something different. 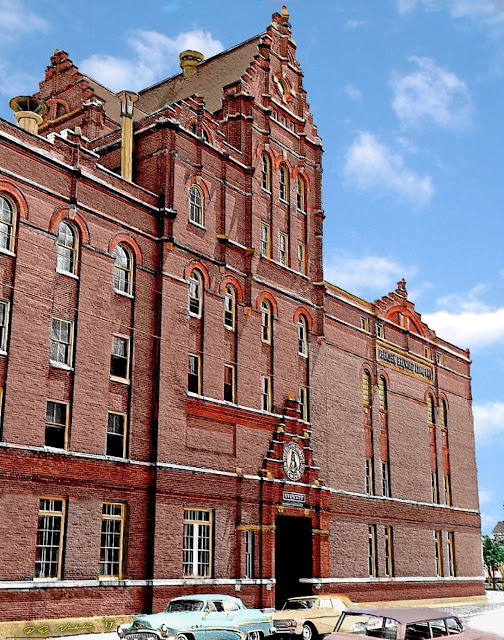 Each of the breweries will present beers that deviate from their core line-up. There'll be a host of barrel-aged beers, cellared beers, and one-offs brewed for this event. There’s another thing we haven't seen before. A beer festival held outdoors in winter. The fest will take place in the parking lot at Bare Bones. It ought to be cozy enough. There'll be a bonfire, games, music, and barbecue from DD's BBQ Company. Wear your boots and let it rip. And when it's over there'll be an after party at O'Marro's Public House where The MadPolecats will play from 7-11 p.m.
January 13, 2018, at Bare Bones Brewery in Oshkosh. General Admission tasting runs from 2 p.m. – 6 p.m.
VIP tasting begins at 1 p.m.
General Admission tickets are $40. That ticket includes 20 - 5oz samples and a commemorative glass. The VIP ticket is $60. VIP includes early access to the festival, 25 - 5oz samples, the commemorative glass, and access to the VIP lounge, better known as the taproom. Tickets are now available at all the participating breweries. You can also get them up online at Brown Paper Tickets. This has been a long time coming. See you there! Oshkosh artist Paul Nickolai uses vintage photographs as his canvas. Imbuing color and texture, Nickolai creates something new from source material that's quite old. I first came across Nickolai's work on the Oshkosh Memories Facebook page. 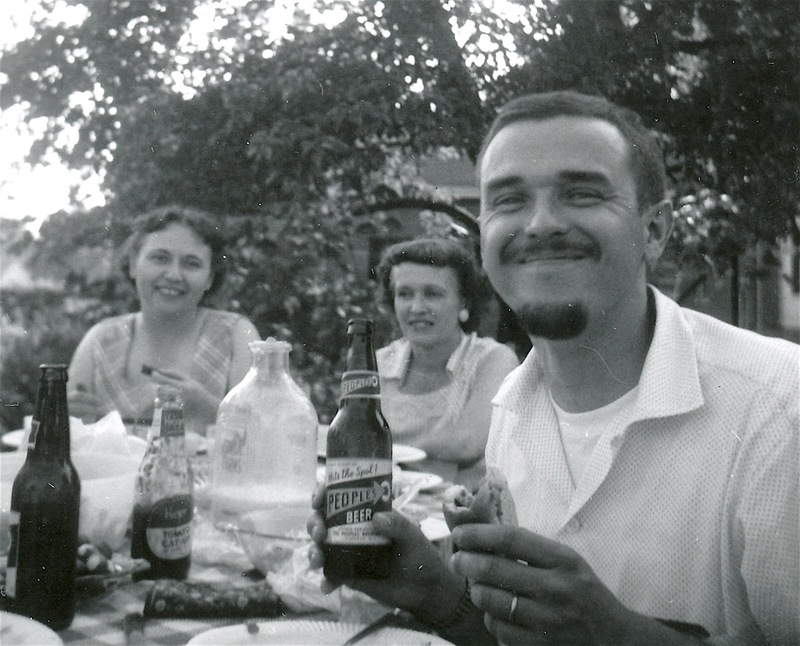 I thought it would be interesting to see what he might do with older photos related to beer and brewing in Oshkosh. The results are coming in. 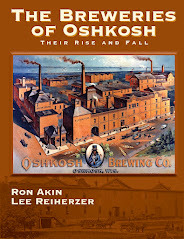 More on the Oshkosh Brewing Company. More on Peoples Brewing Company. A new one from Fifth Ward for the growler collection. This is the first time since 1956, that we’ve had three breweries in Oshkosh. The taproom at Lion's Tail Brewing, Saturday, November 18, 2017. And here we have the first piece of breweriana from the HighHolder Brewing Company of Oshkosh, Wisconsin. It was a great weekend for beer in Oshkosh. The sign painted on the wall at The Granary says it all. The Granary opened with 30 beers on tap. All four Winnebago County Breweries had beer on the tap list. Three of those beers were from Oshkosh. 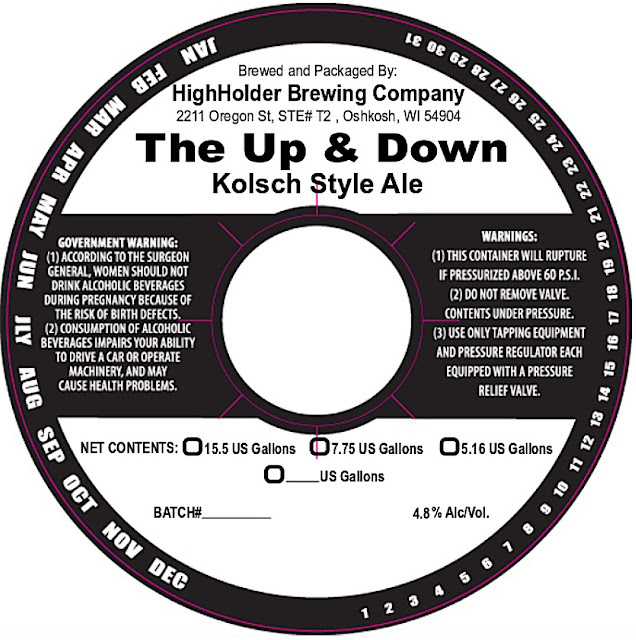 It's the first time three Oshkosh breweries have appeared on tap together since 1956. And I doubt there's ever been a tavern that served beer from four Winnebago County breweries simultaneously. Saturday night was the grand opening of Fifth Ward Brewing. Fifth Ward brought out its third beer this weekend. It's a red IPA named Forman's Basement. Ian Wenger (left) and Zach Clark of Fifth Ward with Forman's Basement. The dry-hopping of that beer included hops grown by Tim Pfeister in Winnebago County. That makes Forman's Basement just the third beer since the early 1880s to be brewed with Winnebago County hops. It's all coming back around. When it comes to beer here, we're living through a revival period. It's going to be looked upon with envy. Enjoy it while you can! The Opening of Fifth Ward Brewing Co. This weekend we get to celebrate the grand opening of a new brewery in Oshkosh. Ian Wenger and Zach Clark have been working to make this happen since 2012. For the last couple of years, they've been renovating the building at 1009 South Main in preparation for their brewery’s opening. On Wednesday, November 8, 2017, Fifth Ward Brewing began pouring its beer. 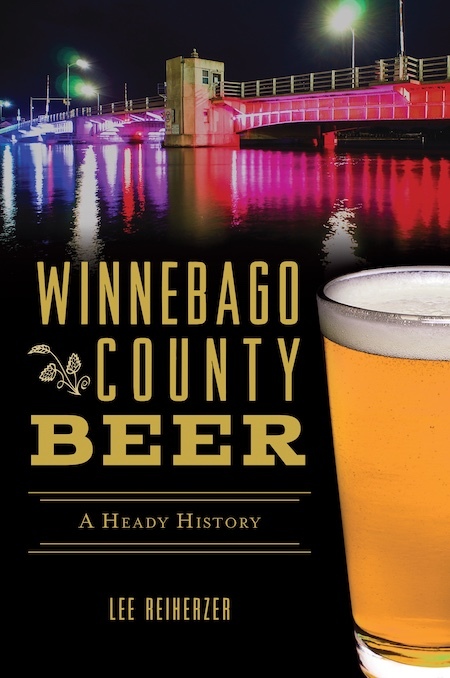 I just signed a contract to write a book about the history of brewing in Winnebago County. It’s going to cover every brewery that's operated in our county – past and present. My hope is that’ll be released before the end of 2018. I'm starting on the book this week. And I’m going to try to keep this blog rolling along, too. I think I can manage both. The posts here will definitely be shorter, but there may be more of them. We’ll see. I was just looking at the long list of blog posts I still want to write. When I started this blog in 2010, I didn't know what I was getting into. I never imagined the beer culture of this place would prove to be so fertile. I'm closing in on 900 posts now. I don't know if I'm even halfway to being done. There are so many more stories to tell! After a two-year hiatus, Casks and Caskets returned Saturday night. Casks and Caskets was launched in 2012 by the Society of Oshkosh Brewers (SOBs). The plan was to have an annual homebrewed beer festival. All went well until the event was shut down by the state after Casks 2014. Even though money generated from the event went to charity, the SOBs were informed that selling tickets to a festival where untaxed beer is poured would, in the future, be considered illegal. It took the club a couple years to find a way to work with that decision. The solution turned out to be fairly simple. Make it a free-beer fest. 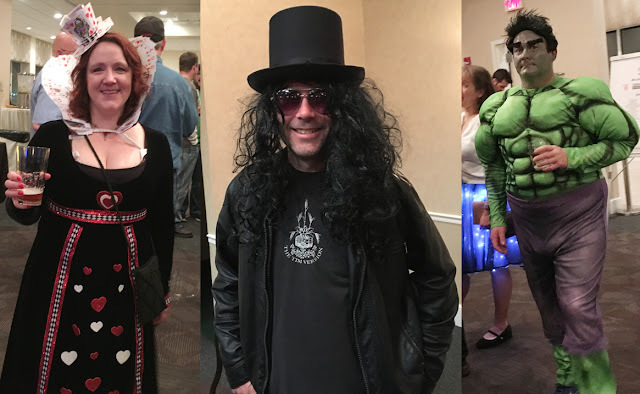 This year, Casks and Caskets was held at the Oshkosh Hilton Garden Inn. And it remained a charity event. Money was raised through silent auctions, raffles, and donations. This year, the money will go to the Oshkosh Hunger Network. There's not another beer fest like this in Wisconsin. There's no other that's absolutely free. And there's no other where all the beverages – beer, wine, cider, mead, soda – are homemade. It makes for an atmosphere different from any other beer event I've been to. SOB president Mike Engel presenting Travis Sullivan his trophy for his "Best of Show" beer. Let's hope we can all get together and do it again next year. 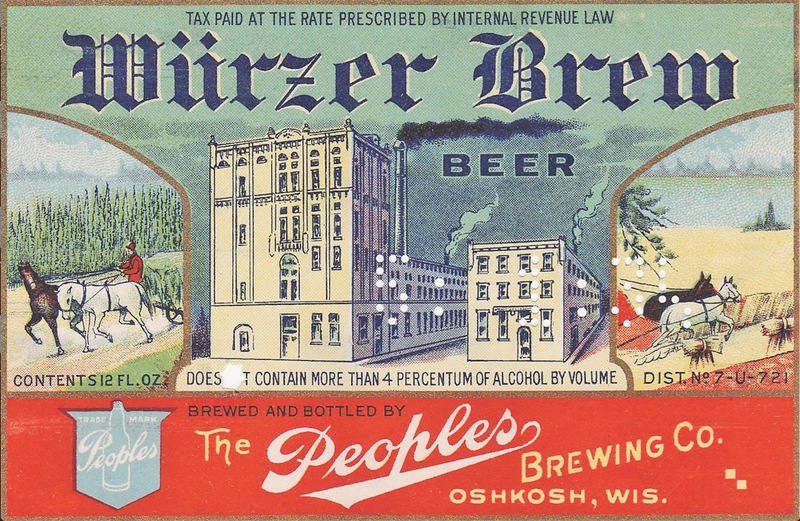 In 1957, Oshkosh’s two breweries owned this city’s beer market. Combined, Oshkosh Brewing and Peoples Brewing produced nearly 90,000 barrels of beer. The people of Oshkosh were dedicated to that beer. Other brands were available. They languished. Most folks here drank either Chief Oshkosh or Peoples. In the glass, the two beers looked much the same. Each was pale-gold. Flavorwise, they were quite different. 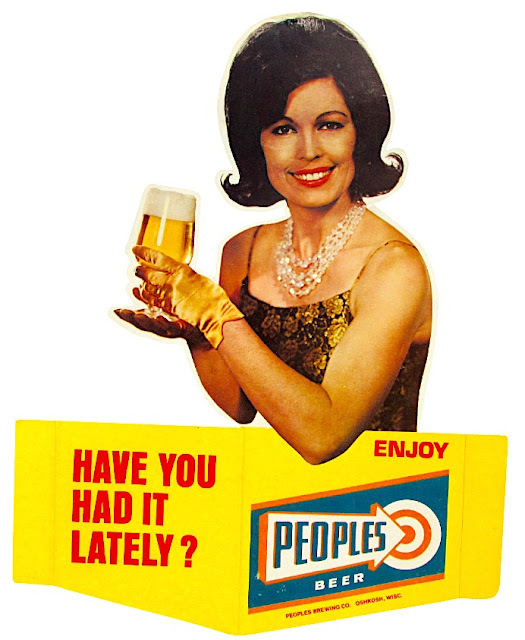 Peoples was a malt-driven beer. Lightly bitter, it was the sweeter of the two. Chief Oshkosh leaned heavier on hops. It was crisp and bitter. A true American pilsner. The two beers were identically priced. Both were available everywhere in town. You might expect the difference in flavor to have been the deciding factor in determining who drank what. It ran deeper than that. The choice tended to cleave along socioeconomic lines. Who you were and where you drank often determined what you drank. In Oshkosh, your beer was part of your identity. 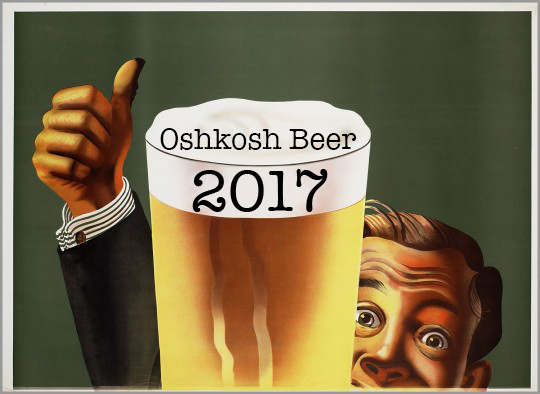 This all gets drawn into focus by an extensive survey commissioned by the Oshkosh Brewing Company (OBC). In 1956, OBC hired the Chicago marketing research firm A.J. Wood & Company to conduct an extensive analysis of the Oshkosh beer market. Wood & Co. visited 5,091 homes in the Oshkosh area to ask people about their beer drinking habits. The survey results were delivered to OBC in April 1957. The survey focused heavily on flavor. This was probably what most interested OBC. 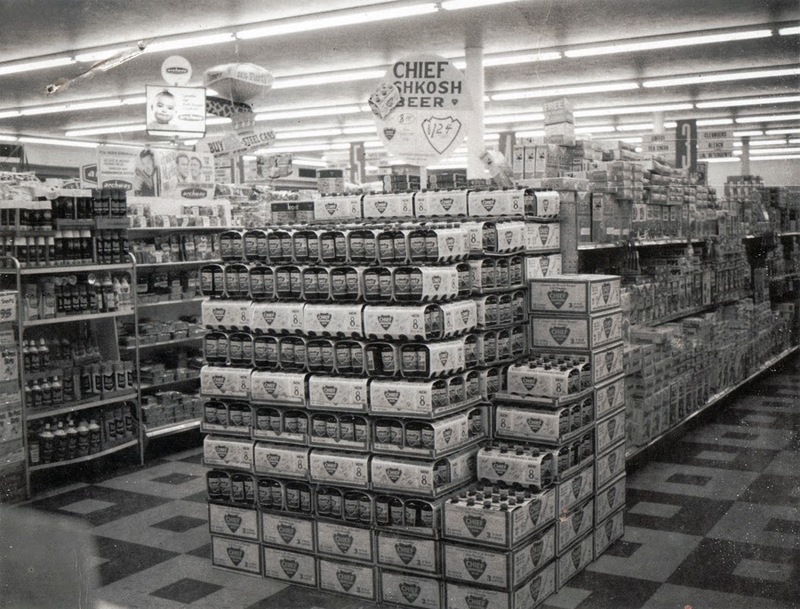 In 1956, the brewery had tinkered with its recipe for Chief Oshkosh. The beer was made even more hop-forward and bitter. OBC sought to draw a bead on what local consumers were making of the change. What the brewery got went well beyond a simple taste test. The result was the most comprehensive picture of beer drinking in Oshkosh for any single period. The first thing that jumps out is the focus on local beer. 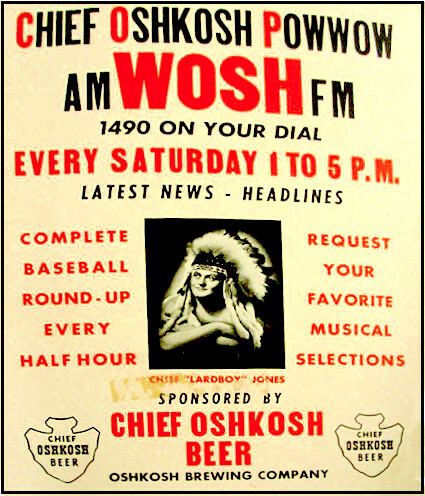 A solid 75% of the respondents identified either Peoples or Chief Oshkosh as their favorite beer. The remaining 25% were devoted to a host of other beers including Blatz, Hamm’s, Kingsbury, Miller, Old Style, Pabst, and Schlitz. None of those beers had more than a 5% share of the market. 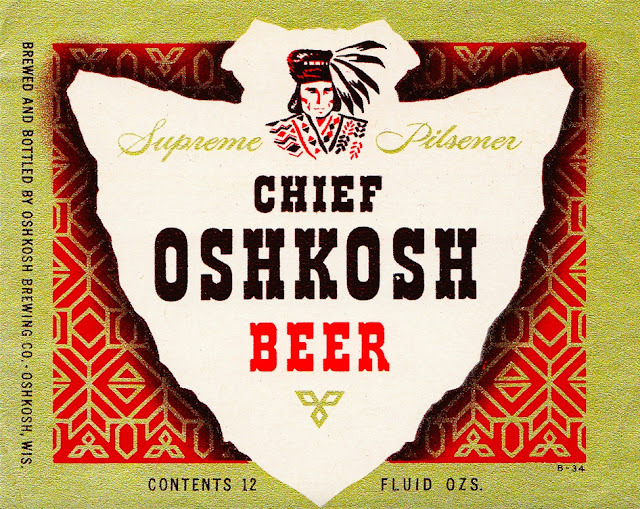 When it came to bottled beer, Chief Oshkosh had the edge with 41% going for Chief Oshkosh and 34% for Peoples. 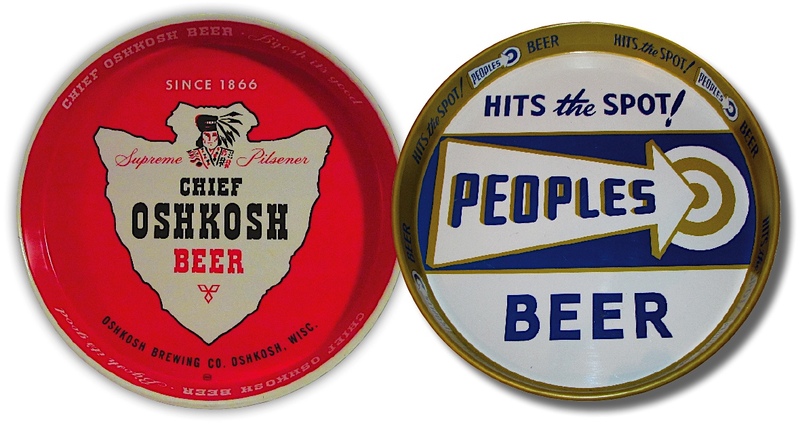 The numbers flipped when it came to draft beer: 41% preferred Peoples, 35% liked Chief Oshkosh. How heavily those people drank also came into play. Light drinkers were identified as those having had fewer than four beers in the previous two weeks. Heavy drinkers were people who drank 16 or more beers in that same time frame. Drilling down further, the authors noted, “Peoples is somewhat overbalanced toward the working classes, while Chief Oshkosh shows greater strength among white collar people and the relatively higher income groups." So, if you were a blue-collar worker who drank their beer in a tavern you were probably drinking Peoples. If you wore a suit to work and drank a beer from a bottle every now and then, you were likely to be a Chief Oshkosh drinker. For the folks at OBC this had to be somewhat concerning. Especially in light of what the brewery was spending on advertising. 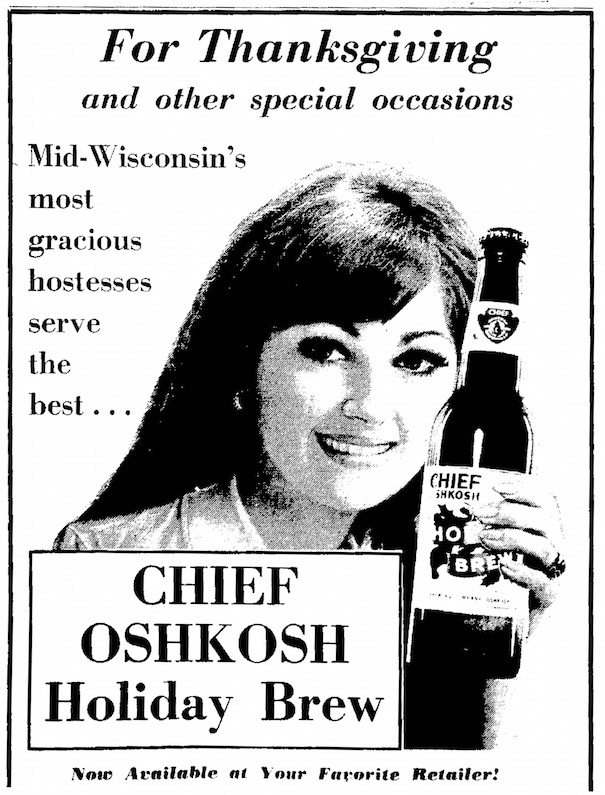 Chief Oshkosh was the most heavily marketed beer in this area. It was advertised on TV, radio, and in print. Peoples, on the other hand, spent next to nothing on all that. They’d place a newspaper ad from time to time. That was about it. This certainly caught the eye of OBC president Arthur Schwalm. He scrawled notes across this page on his copy of the survey. “... this is a problem for a brewmaster.” That brewmaster was Wilbur Strottman, whose name Schwalm wrote on the survey. The other name, Siebel Co., is a reference to J.E. Siebel and Sons of Chicago, which did lab testing of OBC’s beer. The hops are bound to fade in beer treated that way. The kegged Chief Oshkosh wasn’t pasteurized. And it was stored at serving temperature. The flavors were better preserved. The bitterness would have been just as the brewer intended. Damn, I wish I could have tasted that beer. There’s something interesting buried in this. People responding to the bitterness of Chief Oshkosh tended to conflate it with strength. They assumed Chief Oshkosh was stronger than Peoples. Nope. Peoples Beer was 4.6% ABV. Chief Oshkosh was 4.5%. All that was gone 15 years later. 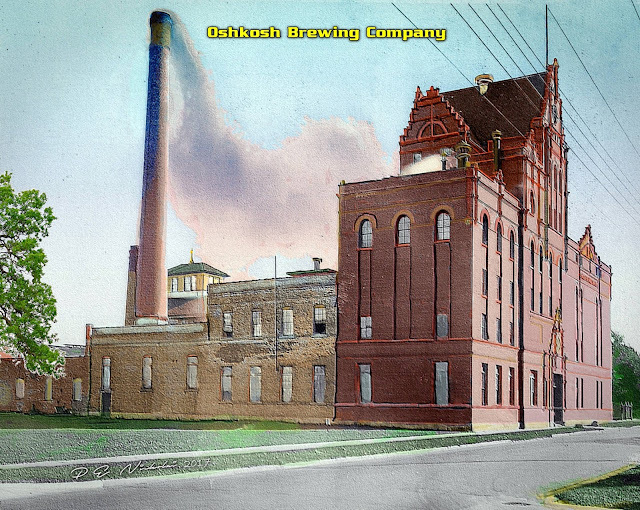 Oshkosh Brewing closed in 1971. Peoples shut down in 1972. We have two breweries again in Oshkosh. Soon we’ll have a couple more. But it’s nothing like it used to be. Tastes have changed. So has the beer. And there’s so much less of it being made. Last year the two Oshkosh breweries produced close to 2,000 barrels combined. That’s about 88,000 fewer barrels than produced in 1957. It’s unlikely we’ll ever see anything like that again. 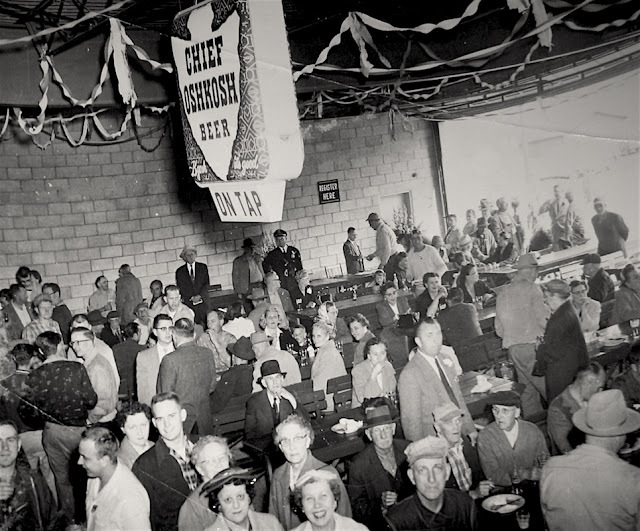 Oshkosh Brewing Company, May 1956. Last Wednesday, RJ Nordlund was at Festival Foods in Oshkosh pushing a cart with just two things in it: a salad and a couple hundred pounds of chocolate chip cookies. The salad was his lunch. The cookies were for his brew kettle. Nordlund is brewmaster at Bare Bones Brewery in Oshkosh. 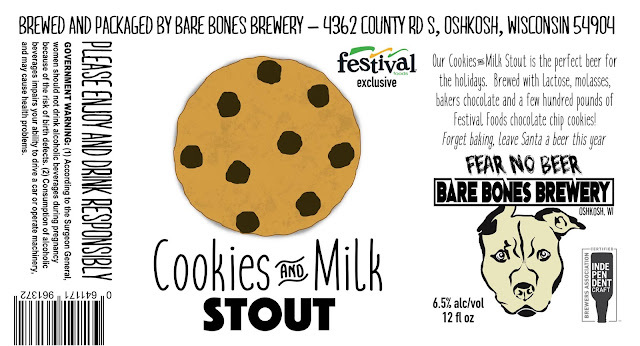 The beer he’s making with Festival's cookies is named Cookies and Milk Stout. It’s the brewery’s holiday seasonal offering. Nordlund brewed it for the first time last year. This year’s version has Bare Bones partnering with Festival Foods. The beer will be packaged in 12-ounce cans in mid-November and sold at Festival’s stores across Wisconsin. 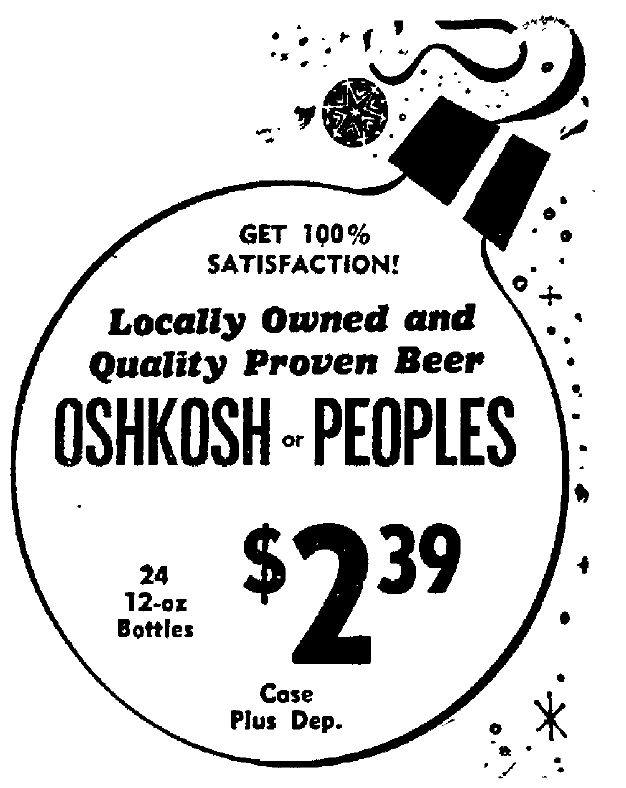 The last time an Oshkosh-brewed beer was distributed this widely was 45 years ago before the closing of Peoples Brewing. This is a beer with a lot going on. The malt bill is extensive. It includes aromatic, honey, caramel, chocolate, and victory malts along with flaked oats. On top of that comes lactose, molasses, bakers chocolate, and chocolate chip cookies. Lots of cookies. Cookies and Milk Stout should start hitting store shelves in the week running up to Thanksgiving. Just in time for the holidays. This week, Bare Bones is installing solar panels at its facility. Owner Dan Dringoli says he expects to have his new power grid up and running within a few weeks. "The system will generate all the power we need for the brewery and taproom," Dringoli says. Bare Bones will become Winnebago County’s first solar-powered brewery. Mid-November will see the release of another Bare Bones beer in cans. Best Buds is a hop-saturated American Pale Ale hopped with Mosaic and nothing but Mosaic. Have a look at the label. If you can get past the double entendres you’ll notice a new symbol at the lower right-hand corner. That's the Independent Craft Brewer Seal. Best Buds and Cookies and Milk Stout will be the first Oshkosh beers to carry it on their labels. More on the meaning of that here. Bare Bones is getting into another kind of brewing. Coffee. They've purchased a roaster and have begun roasting and packaging El Salvador grown coffee beans at the brewery. At the moment, they're offering a medium roast sold in 1-pound bags. You can pick that up in the taproom. Of course, some of those roasted beans will have to make their way into beer. Nordlund says he wants to put a different twist on it. He's thinking of making a coffee, blonde ale. More to come. Finally, tomorrow night (Friday, October 27), Bare Bones will host its annual Bitchin' Bonfire Bone-Nanza. That begins at 7 pm. They'll have BBQ, live music, and a pack of barrel-aged beers available only that night. You'll find all the info here. The brewery hoped the recipient would tear off the postcard portion, fill out the order form on the reverse side, and mail it back to the brewery. Shortly after, beer would be delivered to their doorstep. Here’s a better look at the order form. 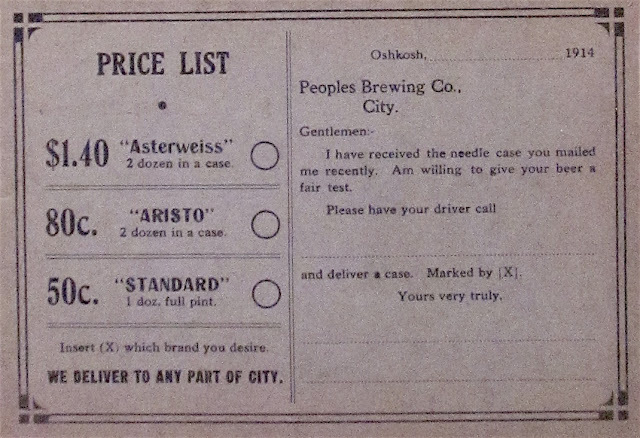 At 80 cents a case, Aristo was among the cheapest beers available in the city. Check out the beer listed below it. Standard, at 50 cents for a dozen pint bottles, was even cheaper. Not by much. By the ounce the difference was a fraction of a cent. What is "un-steamed" beer? It's beer that hasn’t been pasteurized. That was unusual for a bottled beer of this period. The idea was to replicate the flavor of draft beer, which was also unpasteurized. Standard was the same beer Peoples sent out in wooden kegs to Oshkosh saloons. Here they refer to those saloons as “buffets.” They were putting a soft edge on things. In 1914, there was a lot of trash talk being aimed at breweries. Much of it came from the Anti-Saloon League (ASL). The ASL was making huge strides in its push for a nationwide ban on alcoholic beverages. Breweries responded by trying to promote a more wholesome image. Aristo epitomized that. It was a “Family Beer.” What does that even mean? This was also an appeal to women. 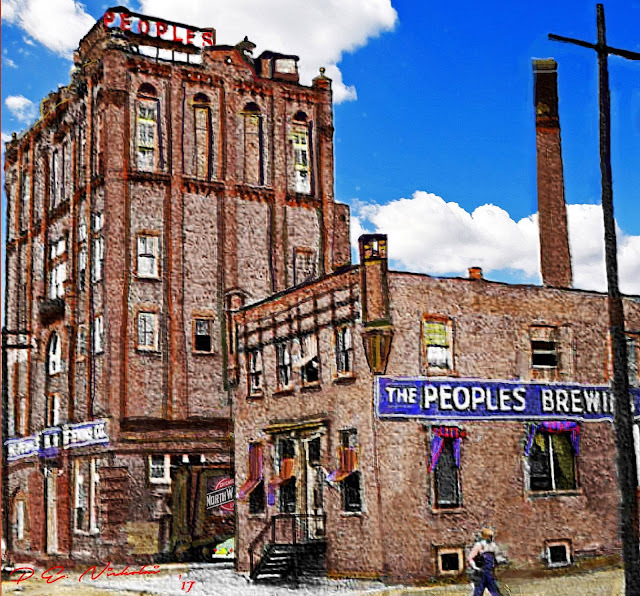 By 1914 – a year after Peoples Brewing opened – sales of the brewery’s beer in saloons was booming. But there weren’t a lot of women hanging out in Oshkosh saloons. If Peoples was going to draw them in it would have to be done through bottled beer sales. The brewery increasingly directed its bottled-beer advertising towards women. 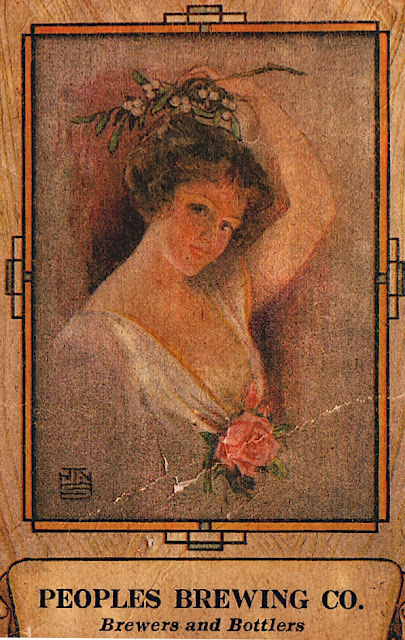 Here’s an example from 1916. “After a day's hard work, tending to the many household duties…” What about the women who were out there working in Oshkosh’s mills? They’re never mentioned in these ads. Peoples issued all kinds of ads featuring working men doing manual labor. But the brewery never portrayed women in such a light. They’re always depicted in the home, exhausted by household chores. Here’s a more accurate picture of the period. 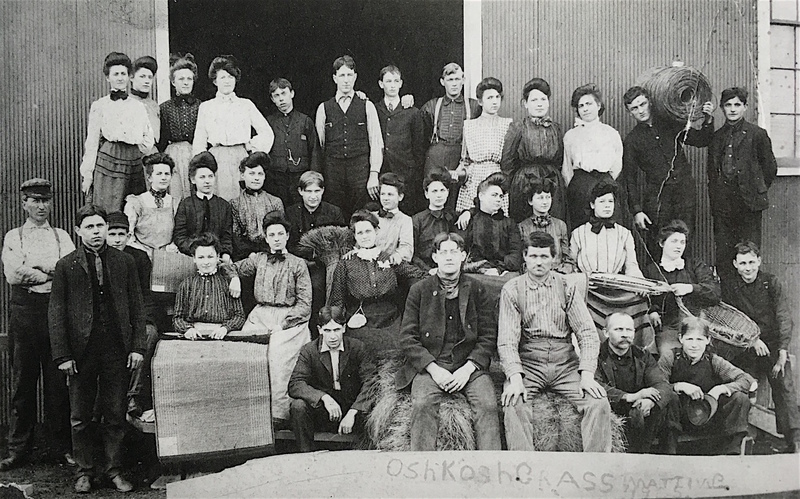 These are the workers at the Oshkosh Grass Matting Co.
I’ll bet a few of those women drank beer. They couldn’t vote, but they could buy beer. That’s the truly dark side of all this. On the whole, breweries were opposed to women's suffrage. Big mistake. The suffrage movement found an ally in the ASL. The two groups joined forces. And in 1919 they rammed through the 18th Amendment to the US Constitution establishing national Prohibition. A year later, the 19th Amendment was passed granting women the right to vote. Had breweries supported a woman’s right to vote, they may have diffused the power of the Anti-Saloon League. 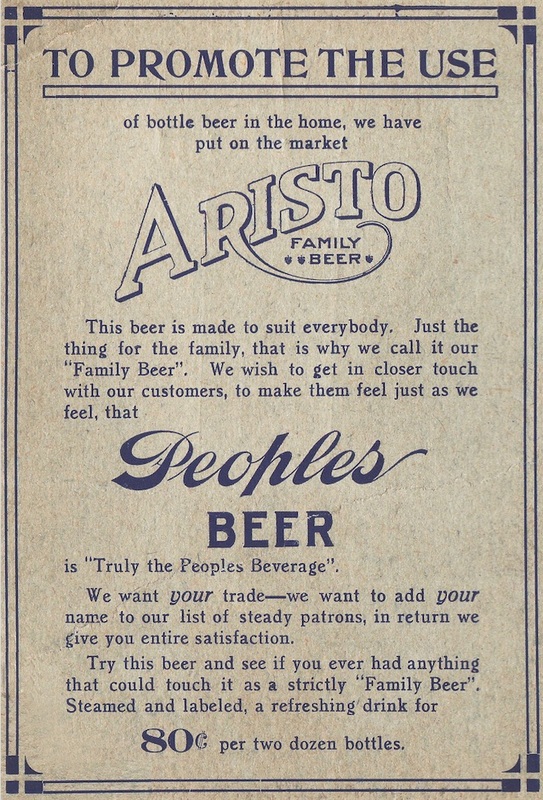 Perhaps the calamity of Prohibition would have been avoided. Ironically, women’s groups would be instrumental in the eventual derailing of Prohibition. 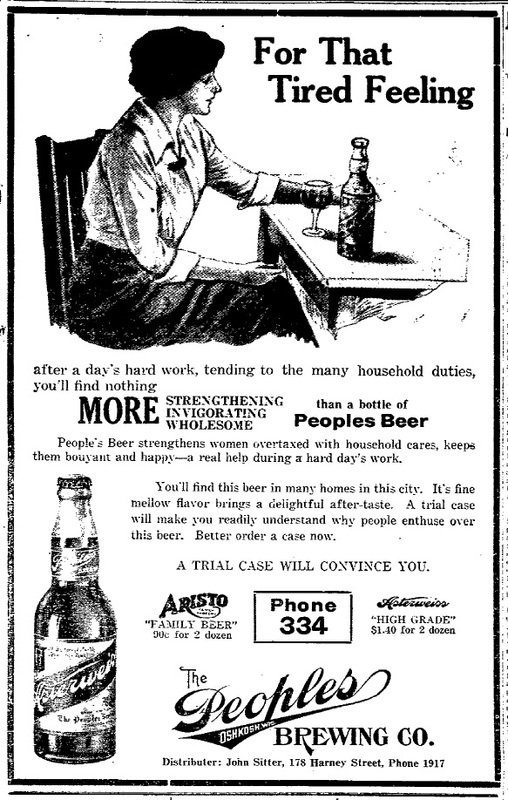 After beer became legal again in 1933, Peoples generally steered-clear of gender-based advertising. If women appeared in their ads at all, the depictions were usually idiotic. Get a load of this from 1971. A year after this came out, Peoples closed. It would have been so much easier to do so much better. The picture below could have made a nice ad. It’s from 1957. The happy couple in Jerry’s Bar is enjoying what else? 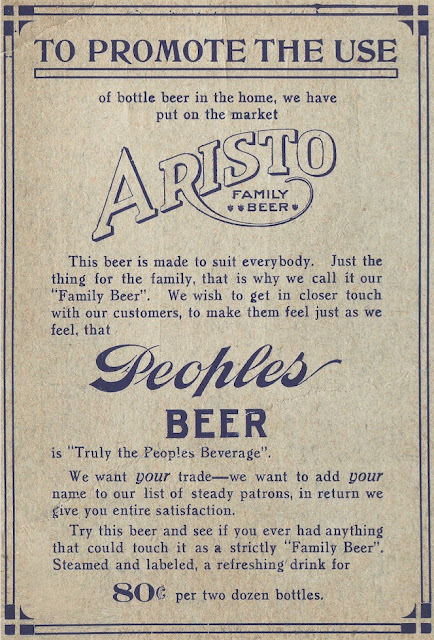 Peoples Beer!